HONOLULU (HawaiiNewsNow) - Terry Shintaku is the owner of Green Growers, Inc., They grows tomatoes in Hauula using hydroponic technology and equipment that dates back to the 1950's. Completed in 1953, they are the oldest hydroponic farm in Hawaii. Originally owned by James Glover, Terry's dad, Graf, purchased the farm from Glover in 1963. Each morning nutrient rich water flushes the tomato beds, where they grow a Dutch variety specifically bred for hydroponic culture, then the water is recycled and the nutrients replenished. Even the cinder in the beds is the original material brought in from Makiki when the farm was first built. It takes about 90 days from seed to harvest. 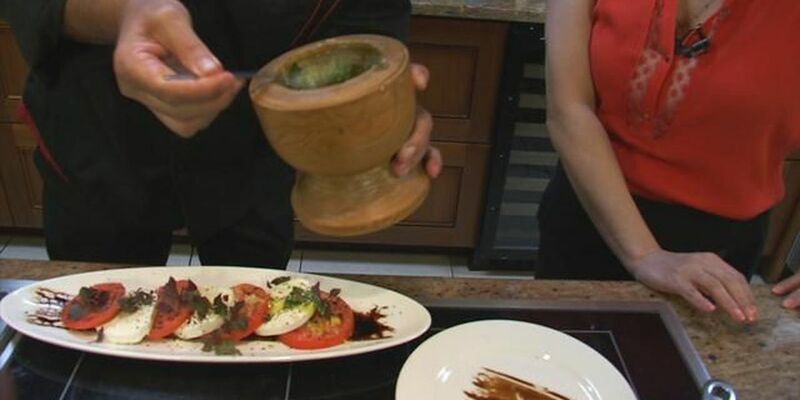 In today's Kitchen Creations, Tikis Grill & Bar Executive Chef, Ronnie Nasuti, will use some of those tomatoes to create a Hauula Tomato Salad with Mac Nut Pesto.